It's easy to laugh at futurist predictions. But when they're proven accurate, it's hard not to be impressed. Especially when it comes to technology that we now use every day. Pausing and rewinding live TV? Dialing up virtually any movie you like without leaving home? Watching films on the go? For the most part, these were all futuristic fantasies in the late 1980s. And according to futurists of the time, they were going to look a bit different than the way that they appear today. The 1989 book Future Stuff by Malcolm Abrams and Harriet Bernstein included dozens of predictions about the future of technology. We may not have the flying cars or the holograph telephones that they assured us were just around the corner. But we've far surpassed their versions of the TV and video technologies that we enjoy today. From DVRs to HD-TV to streaming video, below we have a sampling of how those gadgets and services were imagined in 1989. Today, we take for granted the DVR's ability to pause and rewind live TV. Our TiVo-like devices can even learn what our favorite shows are and record them without so much as a prompt. And in 1989, they saw it all coming. The SmarTV knows just what you like and has been recording your favorites all week—up to 250 shows at a time. Just select which one you warn to see from the jukebox-like menu that comes up on the screen. Another button will give you a brief description of the show. If you think you're interested, press PLAY SHOW. You never have to touch a tape, or figure out how to program the VCR. You can always stop the show (when the phone rings), rewind (if you miss a joke), and, best of all, you can fast- forward at twenty-seven times regular speed past the commercials. Or press STOP and check the menu again. HD-TV was a promise for decades before it became mainstream. Amazingly, the benchmark for what constituted perfect visual quality in 1989 was 35mm film. The TV manufacturers of today certainly aren't trotting out that comparison. The goal for High-Definition TV (HDTV) is to look like 35mm film—rich tones, clarity, and all. That means no more fuzzy edges and shallow saturation for the tube of tomorrow. But Alec Shapiro, who coordinates a group of manufacturers who make the production equipment for high-definition programs, claims that while HDTV delivers 35mm film quality, "HDTV has its own distinct look. It does for the eyes what CDs did for the ears." Remember when a TV was a major appliance that sat on the ground? Yeah, my memory is a bit hazy on that one too. 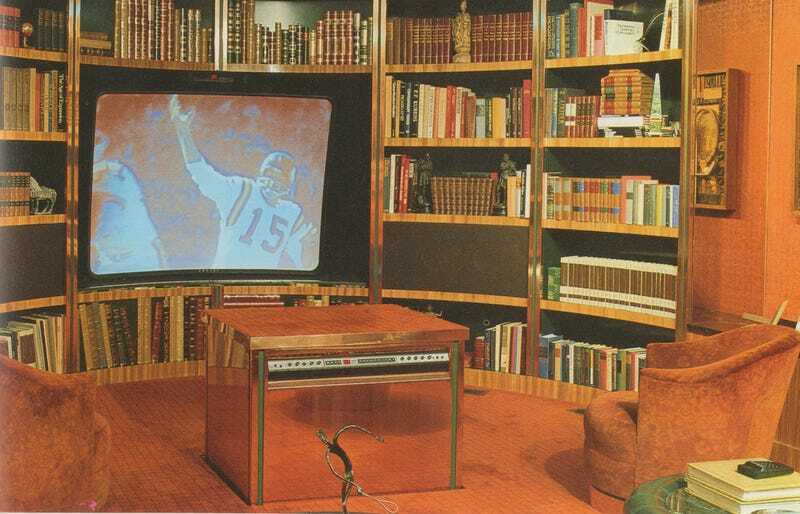 But apparently that was a thing, back before TV was something that you were supposed to hang on the wall like art. A TV so slim that it can hang on your wall like a picture? Don't be surprised if one is adorning your living room sometime in the 1990s. "We haven't become so overcrowded that if a TV isn't flat we won't buy one," says Video Magazine editor Lance Braithwaite. "Nonetheless, there is an aesthetic push for flat TVs. In fact, flat television could be available now," he adds. "but for what price?" That is indeed the question. Manufacturers have been exploring the feasibility of a "full-size" flat TV which will most likely be based on LCD technology. Smartphones have put video players and recorders in our pockets. But it wasn't always that way. A dedicated video-playing device was necessary. And unsurprisingly, people of the 1980s imagined the portable players of the future as something more akin to a Walkman. A tiny revolution has just begun. With the introduction of Sony's GV-8 Video Walkman, we can expect a barrage of new entertainment and instructional videocassettes. But first, the Sony Video Walkman. It's a TV and a VCR. It's hand-held, about the size of a paperback book, weighs 2.5 pounds, is battery-operated, and has a 3-inch color LCD screen. The VCR uses tiny 8mm videocassettes, which can play or record for four hours in the "extended play mode." Today, when we can't find a particular movie streaming online, we become impatient. We're not yet living in a world where you can get every movie and TV show whenever you want it streaming online. At least not legally. But we're close. And these are no longer technological hurdles, but business and legal ones. Those video-rental stores that seem to have sprung up at every corner and mall in America could be out of business by the year 2000. On the way is a system called Advanced Broadcatching, which replaces the video store with a home shopping service that delivers movies right into your computer. All you do is pick up the phone and order up to thirty films at a time. That night, they will be entered into a computer that doubles as a TV for viewing at your leisure. Editing and sharing high quality video used to be the exclusive domain of people with significant financial and technological resources. Video services like YouTube and software like iMovie helped to transform our expectations about user-generated content. Back in the late 1980s, the desktop publishing revolution (courtesy of the personal computer) was changing the way that people looked at DIY media. Surely, the "desktop video" revolution was just around the corner. Soon after desktop publishing became a buzz word in the computer world, desktop video rolled itself into the list of the new and amazing. The professionals who do the computer graphics on your nightly news hour were astonished at first, but for basic video enhancing many of them now have the same system in their studios that you can buy for your home use. So it's your turn to make the clouds speed by under images or words that you create.